Jeff Horn’s trainer Glenn Rushton has warned Terrence Crawford that he will be shocked by the WBO welterweight champion’s buzzsaw attack when the two undefeated boxers meet in a mandatory title fight in the United States later this year. Former martial artist Rushton, who has been likened to a cross between Chuck Norris and American life coach Tony Robbins, recalled the early rounds of the Fighting Schoolteacher’s breakthrough fight against Manny Pacquiao last year. 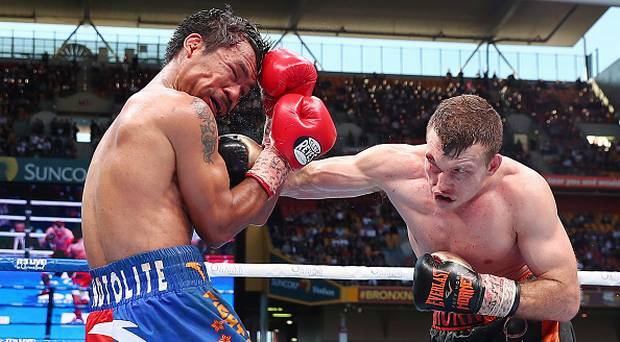 “I remember seeing that wry smile on Manny Pacquiao’s face after the first round against Jeff as if to say ‘Boy, this is going to be much tougher than I thought’,’’ Rushton told Brisbane newspaper The Courier Mail. “It’s going to be a blistering fight and we fully intend to shock the world just as Jeff did in beating Pacquiao. Crawford has been knocking out lightweights and super lightweights throughout his career but Jeff is a much bigger guy at welterweight than anyone Crawford has fought. Horn 18-0-1 (12) and Crawford 32-0 (23) were scheduled to fight on April 14 in Las Vegas until an injury to the American’s right hand in sparring forced the fight to be postponed next week. The new date is likely to be May 19 or in early June. The outspoken Rushton praised the switch-hitting challenger’s variety in attack and said that Horn would have to be wary of Crawford’s aggressive streak. “The most dangerous thing about Crawford is that like Jeff he’s so changeable,’’ said Rushton.